This week I’m sharing another recipe from… Yep, you guessed it: The Four and Twenty Blackbirds Pie Book by Emily and Melissa Elsen! The others have all been fantastic, from their Black Bottom Oatmeal Pie and Salty Honey Pie to the Nectarine Blueberry Pie I posted a few months ago. But this one earned the title of being the best apple pie my mom has ever tasted, and probably the best one I’ve ever had, too. The crust, the filling, the luscious caramel sauce, and the flaked sea salt all work together to make a masterpiece. Have ready in the refrigerator a pastry-lined pie pan and lattice strips for the top. 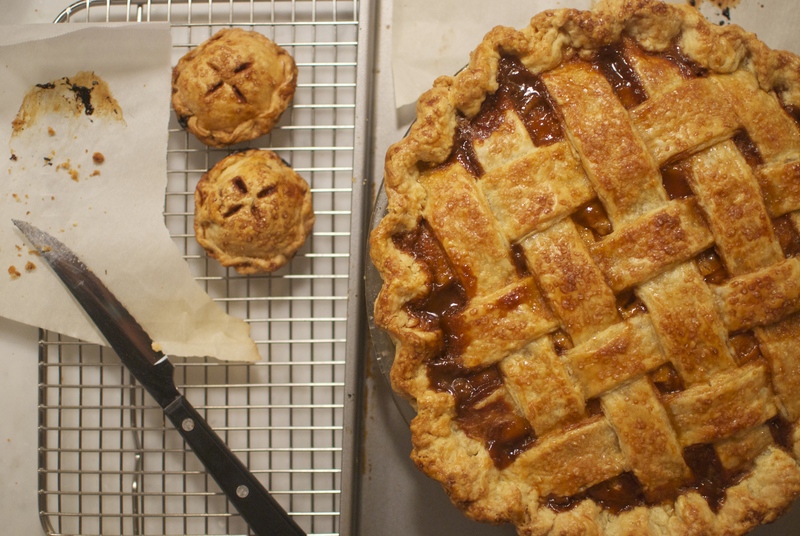 I use an All-Butter Pie Crust that is crazy good. The filling starts with a simple caramel sauce, and the good news here is that you’ll have extra! Eat it by the spoonful or drizzle it over ice cream. 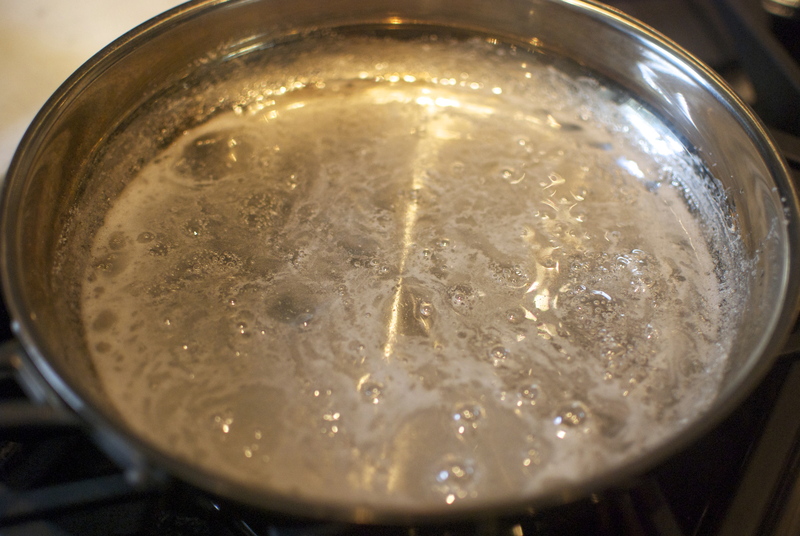 Begin by combining sugar and water over medium low heat. Cook this until the sugar is dissolved. The mixture will be more clear. 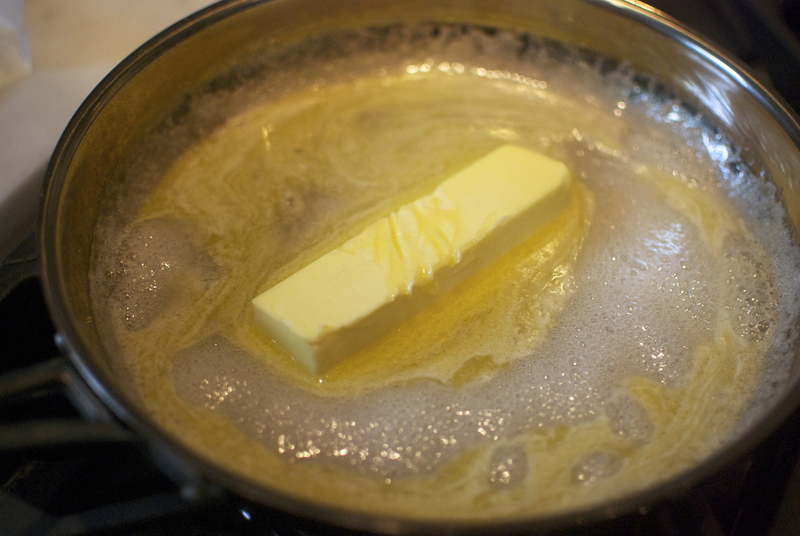 Throw in a stick of butter and cook over medium high heat, bringing the mixture to a slow boil. 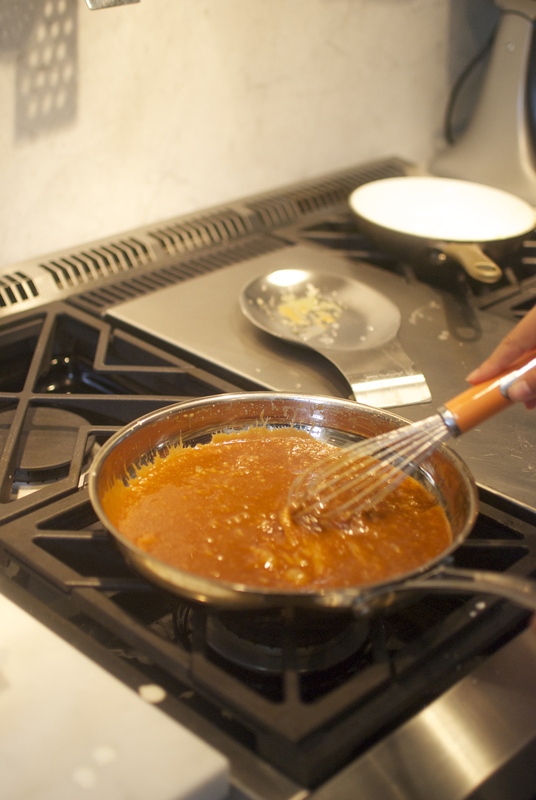 Keep going until the sauce is a dark golden, copper color, whisking occasionally. Now remove from heat and CAREFULLY drizzle in some cream, whisking as you go. The sauce will steam and bubble like there’s no tomorrow, so watch out! Stir this one last time and set it aside to cool. Now for the apples! Cut ’em pretty thin either by hand or with a food processor (or a mandolin slicer, for that matter), squeeze some lemon juice over the top, and toss them with some sugar. When I made this pie again last night, I cut the apples a little thicker than the above image, which I actually found to be preferable. And when I say I cut the apples, I mean my mother, because I’m allergic to raw apples. I know what you’re thinking: Okay, you’re allergic to eating raw apples. But that’s no excuse to make your mother slice them all for you! Yeah, well… That’s what I thought, too. But when I made this pie for the first time and set out to chop my fruit, a squirt of juice landed directly in my eye, resulting in swollen redness and rushing to wash it off, followed by much needed eye drops. Baking is always a good time when I’m around. 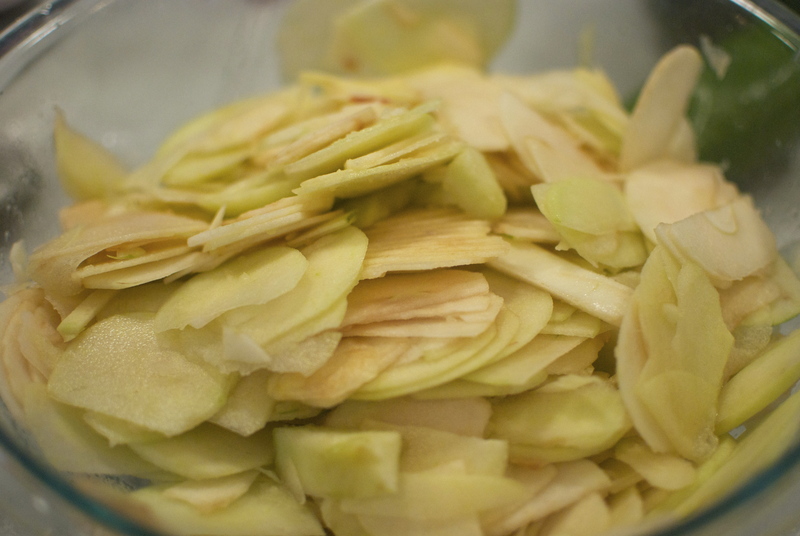 Anyway, once you have the apples sliced and in a large bowl let it sit and give off juices and contemplate life for 20 minutes or so. 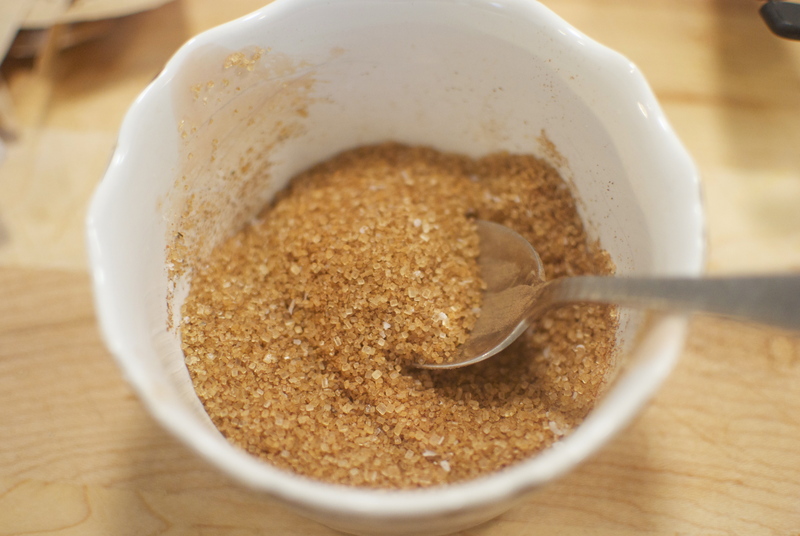 Then, stir together some raw sugar, allspice, cinnamon, nutmeg, black pepper, salt, and flour. 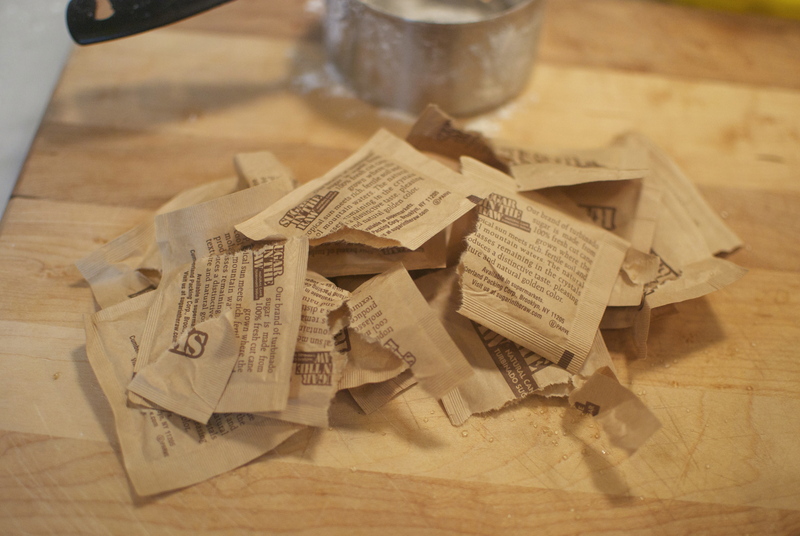 This will be much, much easier for you if you are not using individual packets of Sugar in the Raw. Strain the excess juice from the apples and add in the spice mixture, making sure everything is nice and coated. 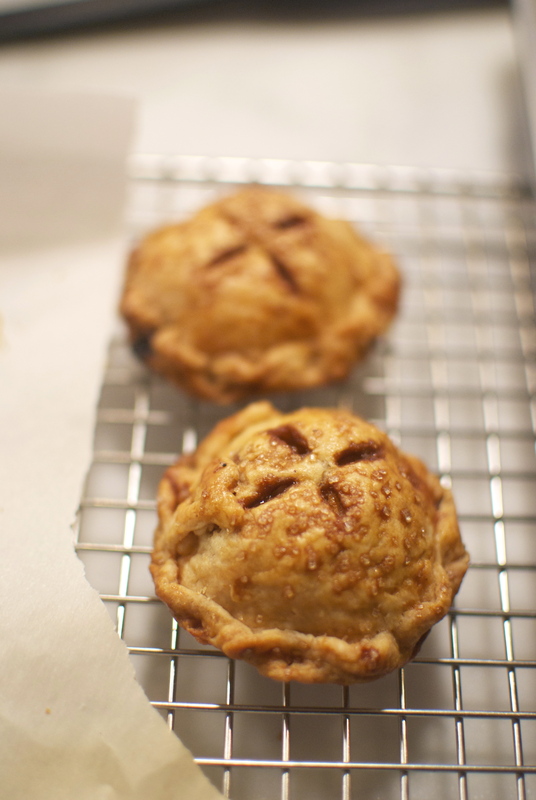 Now retrieve that pie crust of yours, and layer the apples tightly. I like to start at the edges and work my way in, then repeat the process. Measure out 3/4 cup of caramel, and after two layers, drizzle a few spoonfuls of the sauce over the apples. Then continue with another two layers, drizzle, and layer the rest of the apples in one last time. 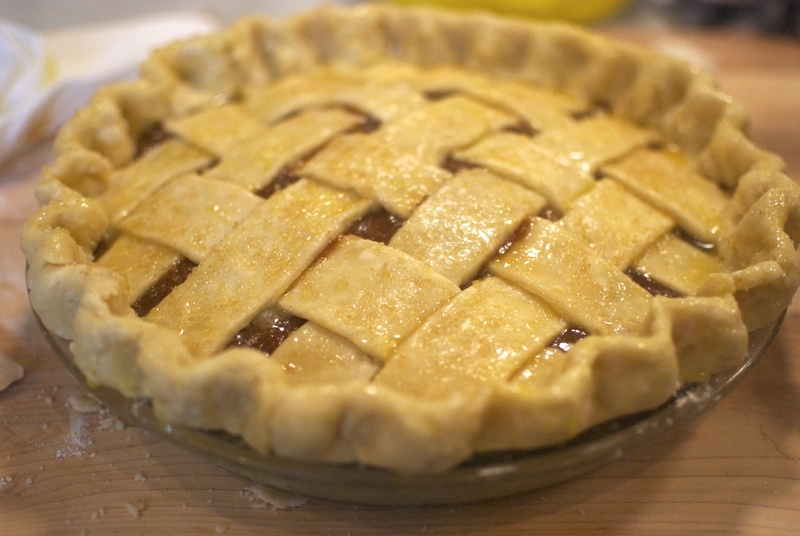 Spoon or drizzle the remaining measured-out caramel over the top of the pie, finish with a bit of flaked sea salt, and weave your lattice right on top. Crimp the edges and put in the fridge for 10 minutes while you heat the oven to 400 F,m and place a baking sheet on the bottom rack. Now just brush the crust with egg wash, sprinkle on more sea salt and some raw sugar, and place on the baking sheet on the lowest rack of your oven. Bake this for 20-25 minutes, until the crust is beginning to brown, and then move the pie to the middle rack of the oven, lowering the temperature to 375 F.
After 30-35 minutes, the pie should be golden and heavenly. 1. Have ready in the refrigerator a pastry-lined pie pan and lattice strips for the top. 2. 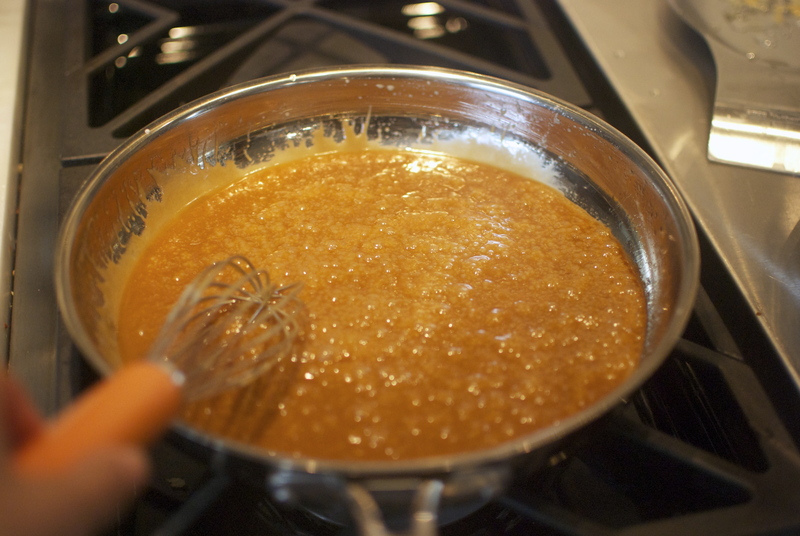 To make the caramel sauce, begin by combining sugar and water over medium low heat. Cook this until the sugar is dissolved (the mixture will be more clear). Add in a stick of butter and cook over medium high heat, bringing the mixture to a slow boil. 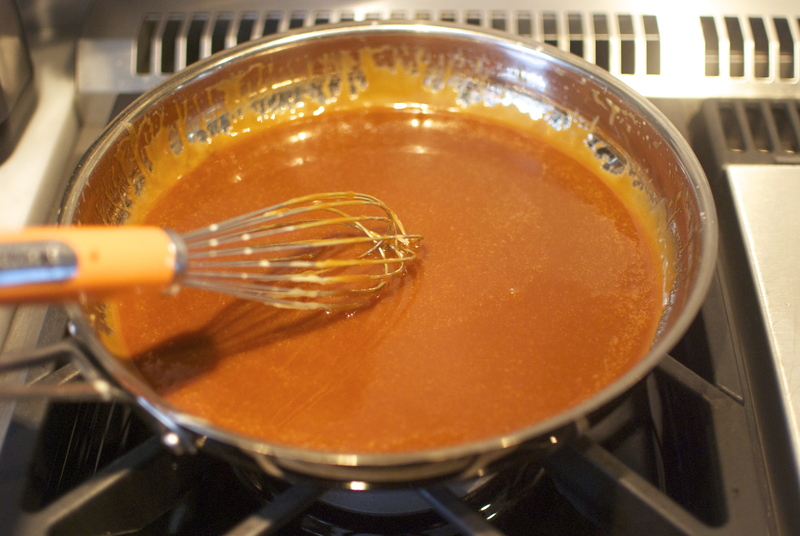 Keep cooking until the sauce is a dark golden, copper color, whisking occasionally. 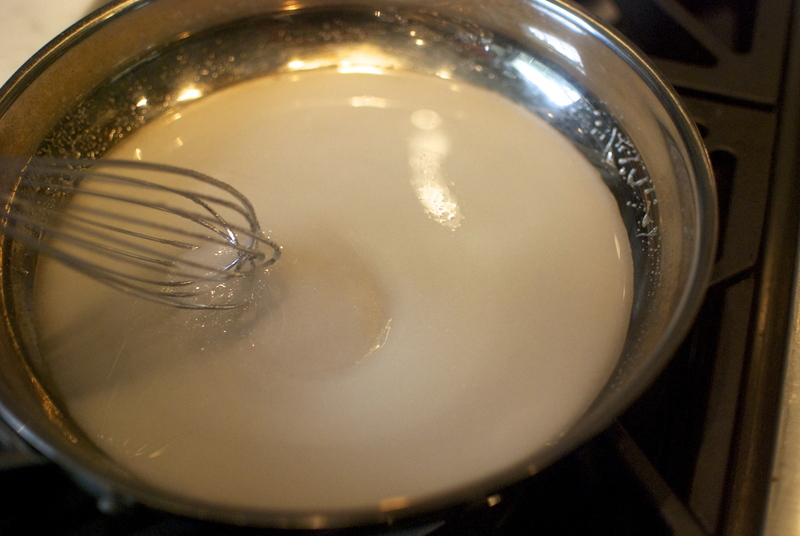 Now remove from heat and CAREFULLY drizzle in some cream, whisking as you go. The sauce will steam and bubble up. Whisk one more time and set aside to cool. 3. Slice the apples pretty thin either by hand or with a food processor (or a mandolin slicer), squeeze the lemon juice over the top, and toss them with the granulated sugar. Set aside for 20 minutes. 4. 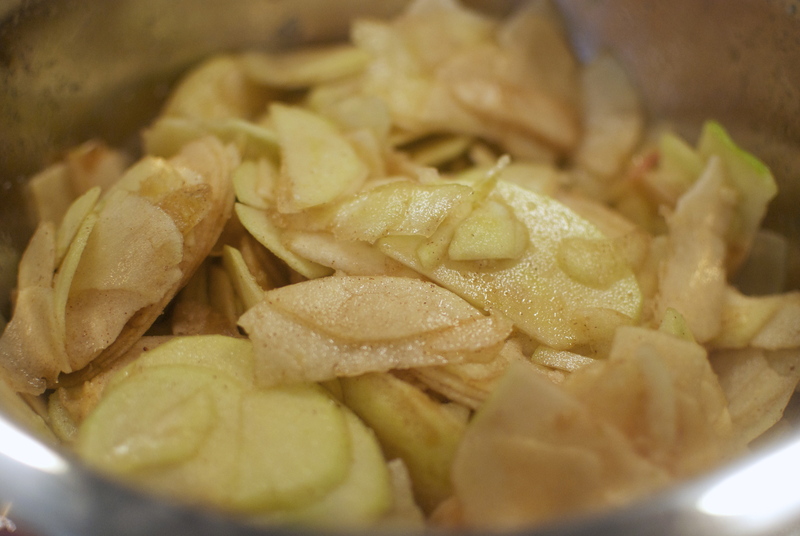 When the apples are ready, stir together the raw sugar, allspice, cinnamon, nutmeg, black pepper, kosher salt, and flour. Drain and discard the excess juices from the apples and sprinkle the spice mixture on top of the fruit. Stir together to coat. 5. 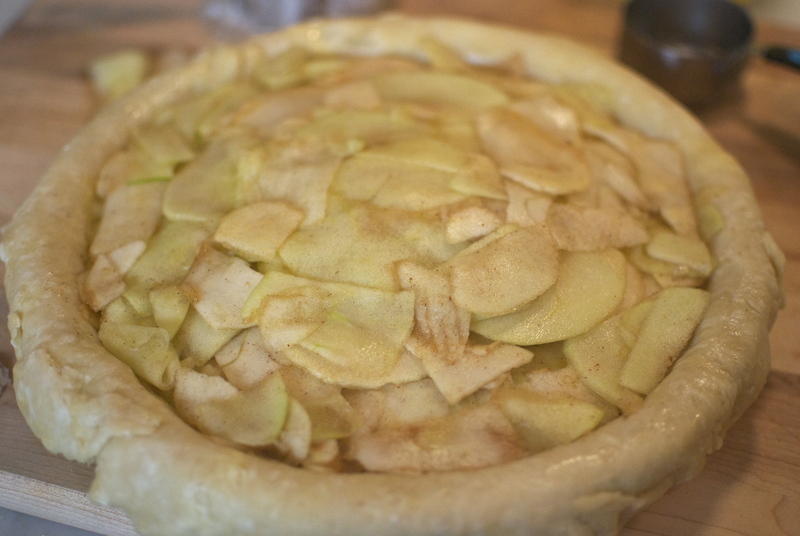 Layer the apples tightly in the crust lined pie pan. I like to start at the edges and work my way in, then repeat the process. Measure out 3/4 cup of caramel, and after two layers, drizzle a few spoonfuls of the sauce over the apples. Then continue with another two layers, drizzle, and layer the rest of the apples in one last time. 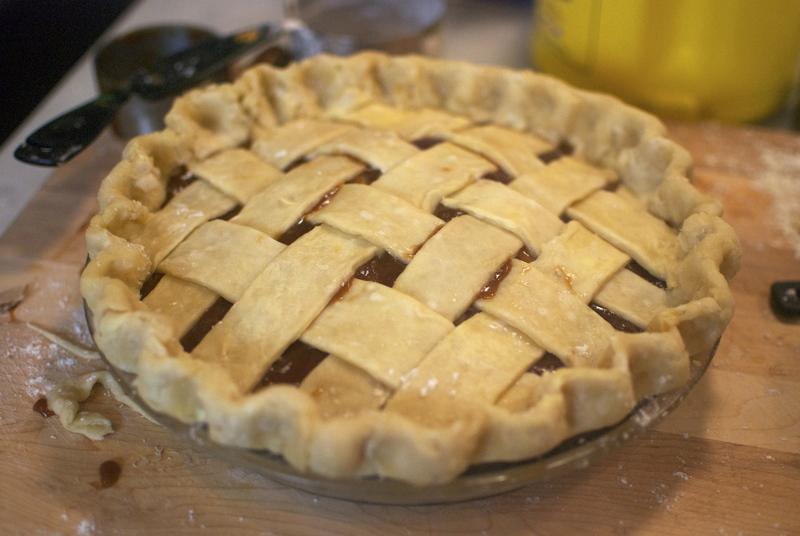 Weave a lattice on top and crimp the edges. Return to the refrigerator to set for 10 minutes and preheat the oven to 400 F, placing a baking sheet on the bottom rack. 6. Bake the pie on the baking sheet on the oven’s lowest rack for 20-25 minutes, until the crust is beginning to brown and looks set. 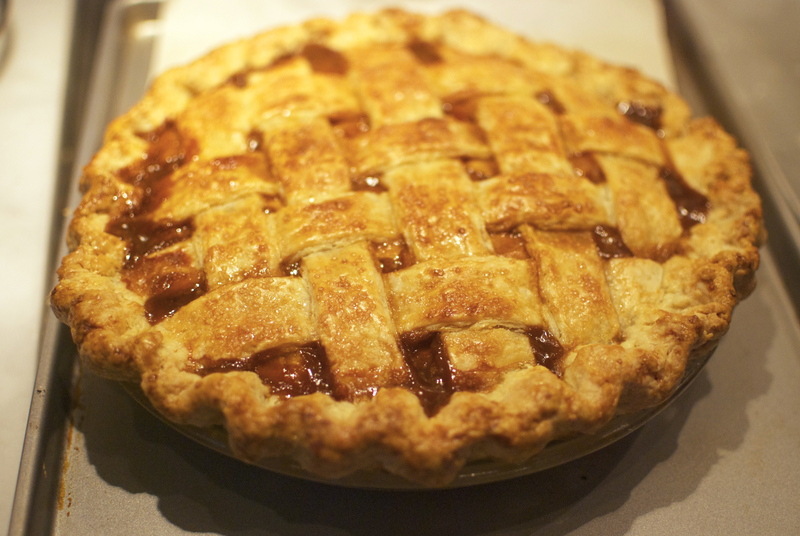 Lower the temperature to 375 F and move the pie to the middle rack, baking for 30-35 minutes longer, or until the crust is dark golden and the filling is bubbly. Allow to cool before serving. If you only bake one thing this year, make it this pie. And if your’e planning on baking many things this year, still bake this pie! Happy nibbling! WOW I’m definitely making this. Please let us know how it turns out if you do! It really is the perfect fall dessert.